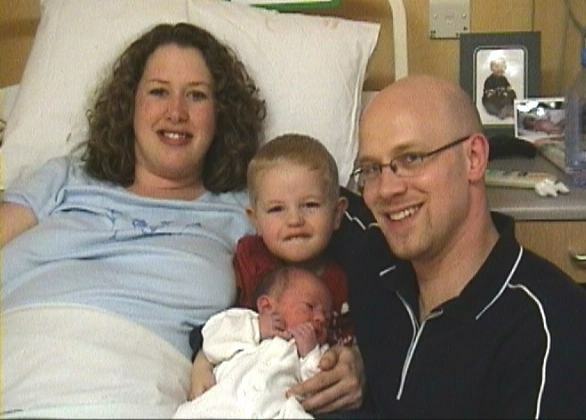 I'm Luke Marcus Morland and was born today, the 31st March 2000, at 11:08am. I was a bit awkward and wouldn't budge for 2 days, so they cut this big hole and took me out instead. Which was nice. 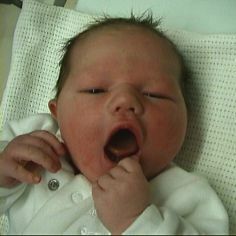 It turns out I'm a pretty big lad, weighing at 9lb 3oz - Light-heavyweight I think. As you will see, I'm fat and bald, so I must apparently be a percussionist, chairman or conductor of some kind. Mind you, I've got a real pair of lungs, and Grandad John already says I should join him in the BBb basses at Thirsk Band. Apparently it's fun there - Great Granny Worley was even kind enough to knit me a band jumper, so I might give it a go sometime. Grandma Sue says I should join The Harrogate Band though. I must admit it does feel good to be the first baby born out of the North of England Brass Band Champions 2000! I did like that strange music you played, although it sounded a bit fuzzy from where I was listening from. And what was all that shouting 'Ha' about? Mum must have liked that bit as she shouted it all last night. I still didn't budge though. Perhaps I'll visit both bands for a few years before I decide! My name is Daniel Philip Lancaster and I was born on Wednesday night. Dad got really cross because he had to miss band practice, and to make matters worse, Mum had to miss as well! Apparently I'm Daniel after the conductor in Brassed Off and Philip after someone that Dad rates very highly (Wilby? Sparke? McCann?) but I think that it's got more to do with The Archers myself. I should think myself lucky I suppose - much better than Punchinello Ravenswood Lancaster which was on the cards a couple of weeks ago, cause Dad reckons it was just after Whit Friday that they.....well, you know. I'm looking for a band to join, in about ten or eleven years time. I've got long arms, I'm hairy all over and I can make one hell of a noise, so I think I'll make a good bass trombonist but Dad says that this is a contradiction in terms and in any case he won't have one in the house. I've been going along to Harrogate Band for the last nine months or so, so I know all their music inside out, especially the timpani part to Culloden Moor. If I ever meet Gareth Wood I'll tell him exactly what I think of all that banging about, and I'll kick him just like I kicked my Mum every time she played it! Triumphant Rhapsody (which we won with at Hardraw Scar in September) was much more my kind of piece - not so many bangs. I'll be making my contest debut at Basildon this year cheering (and screaming) for Horsham Band, which Dad is conducting, but Mum says that I can go to Darlington to hear Harrogate if I'm good. Bloody Culloden Moor both times, mind. (I'd better keep quiet on this one or else I might have to go to the other six areas as well). I'm trying to get a band together in the maternity ward but all the other kids are into quasi-improvised a capella bebop, or at least that's what it sounds like to my trained ears. What's this d.lancaster business? Remarkable foresight of my Dad to get me an e-mail address so early on, but where's the browser? Where are the games? Must go - time for a feed.